When Ghanian artist Azizaa Mystic started taking her music career seriously, she began to incorporate West African deities into her lyrics. “If I’m going to sing, I’m going to sing about what I’m passionate about,” Mystic said. 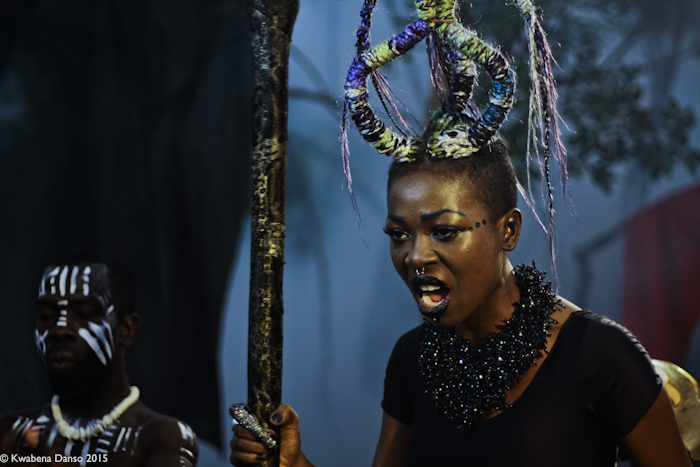 In her new music video “Black Magic Woman,” she contrasts spiritual practices from West Africa, including Vodun (which is sometimes called Voodoo), and Christianity. To her, Christianity marks a departure from Ghana’s spiritual traditions, and now that she has the mic, she’s reclaiming Ghana from Christianity through music one song at a time. Ghana is one of the most religious countries in the world. Ninety-six percent of people call themselves religious, according to a recent International Gallup Poll. And most of them — 71.2 percent — follow Christianity, which was introduced as early as the 15th century through the early modern Atlantic slave trade. The number of people practicing traditional religions is only 5.2 percent of the population. Mystic was raised Christian in Ghana, but left the country and moved to the U.S. at the age of ten. Now, having left the church, her music is influenced by indigenous spiritual practices from West Africa, including Vodun. “What I needed to do was go back to where I came from, or sankofa — return to my roots,” she said. We spoke with Mystic about how her music marks a return to the traditions that she says are vital to understanding Ghana. How has Ghana, your native country, influenced your music? With the “Black Magic Woman” song — it has a lot to do with your traditional music. It’s derived from traditional music — like Ewe music or Agbadza. A lot of the sounds in the instruments and in the beat — it’s all Agbadza sound blended with Trap [music] and 808 [drums]. It has a little bit of Adowa, which is from the Ashanti tribe in Ghana. Everything is really inspired from the traditional sound. For me Vodun is not a religion, it’s a way of life. … The ground you walk on is Vodun — there’s Vodun in it. The very air we breathe is Vodun. I come from a family of musicians. They mostly perform traditional music — gospel. My mom sings, my dad sings. I use to wake up when I was a kid to my mom and dad singing. My dad training his voice. I tried to do what I can — listen and memorize. And then we would go to church and sing. I came from music. Can you describe your relationship to Vodun? Vodun is the African way of how Westerners would call God. It’s the spiritual system of the African people. The real term is not Voodoo — it’s Vodun. It’s been Westernized as Voodoo. It’s a spiritual connection to the universe, to our God. For me Vodun is not a religion, it’s a way of life. It’s our core of everyday life. That reflects in the music because it is part of me. The ground you walk on is Vodun — there’s Vodun in it. The very air we breathe is Vodun. How have religion or spirituality influenced the way you create music? I can’t really pinpoint how Christianity influenced me. It doesn’t pertain to me because I don’t believe in Christianity. For Vodun, I would say everything. For example, one instrument I play, the gong — it’s the talking drum. In Vodun, drums are known for calling spirits because of the vibrations. That was the reason why [slave masters] stopped African slaves from playing drums. Why did you decide to make music about your separation from Christianity? Colonialism has led Africans to think that this religion is for us, but really it is not. Since the days of colonization, we’ve been separated from our spiritual foundation.They basically came with the Bible, gave us the Bible, we closed our eyes to pray, and then they took our land for themselves and we were left in chains. In the opening scene of your new music video for your song “Black Magic Woman,” two missionaries pressure a woman to convert to Christianity. How much of this is based on our own experience? Missionaries always direct angry messages towards me. In Ghana, the normal look — the accepted look — is a weave or permed hair. You know, to have a straight face [is] the perfect image. I have piercings and my hair is colored. And when I walk down the street in Ghana, I get all kinds of names.